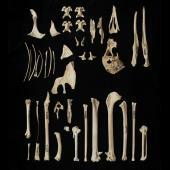 Scarlett’s shearwater is known only from sub-fossil bones collected from a few localities in northwest Nelson and the Buller District. 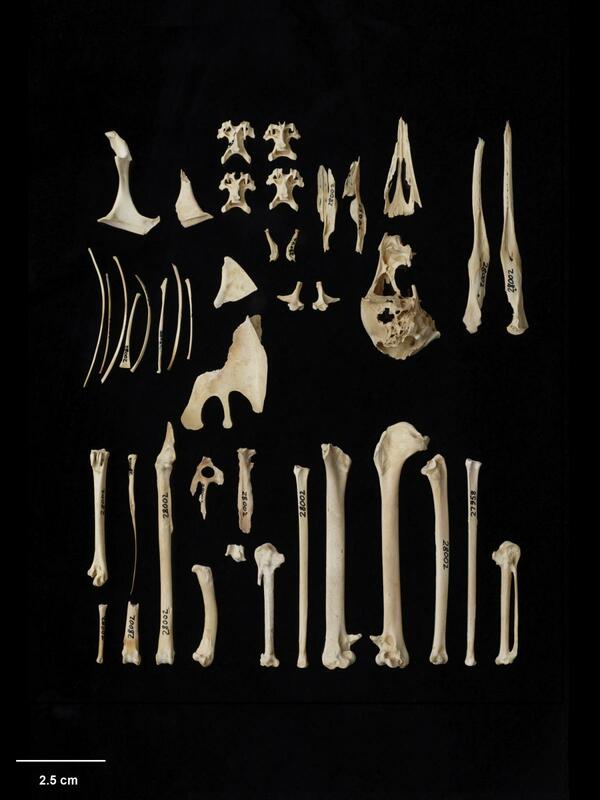 The holotype (NMNZ S028002, partial skeleton) and paratypes (a series of bones from the type locality, the most important of which are NMNZ S27964 and NMNZ S27958) are held at the Museum of New Zealand, Te Papa Tongarewa. The type locality is Te Ana Titi Cave, Fox River. The age of the bones ranges from the last glacial maximum (Otiran, late Pleistocene) to post-Polynesian settlement (late Holocene). The specific name refers to the occurrence of this species in cave deposits. The common name honours Ron Scarlett (1911-2002), the New Zealand palaeontologist who first recognised the distinctness of the fossil material later attributed to this species. Scarlett’s shearwater is a typical shearwater of the Manx/fluttering shearwater group. 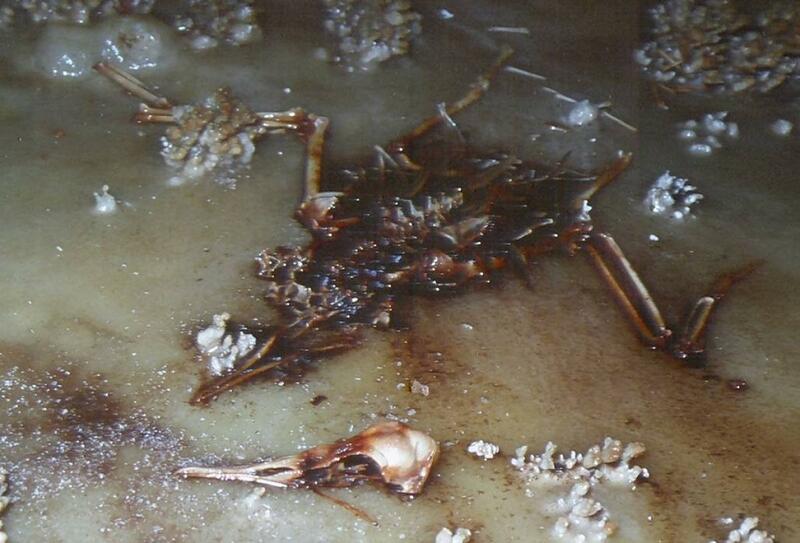 DNA analysis shows that it forms a strongly supported monophyletic clade with two extant endemic New Zealand shearwater species, the fluttering shearwater (Puffinus gavia) and Hutton's shearwater (P. huttoni). 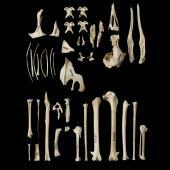 It is believed that these species diversified in the Pleistocene. Scarlett’s shearwater was smaller than its presumed closest relatives, and weighed about 250 g. The wing proportions of Scarlett’s shearwater are very similar to those of the fluttering shearwater and unlike the longer-winged Hutton’s shearwater, which indicates that Scarlett’s shearwater was relatively sedentary (like the fluttering shearwater and unlike the migratory Hutton’s shearwater). 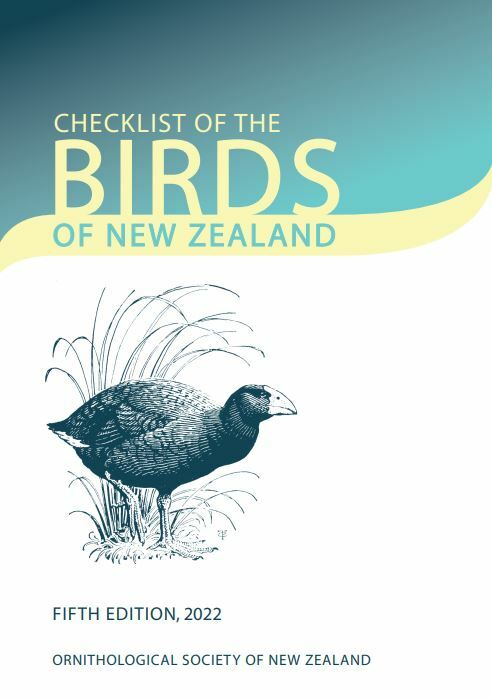 The three species bred allopatrically, with Scarlett’s shearwater favouring wetter forests and highland regions as well as coastal sites within northwest Nelson and Buller, fluttering shearwaters on islands and headlands in the Marlborough Sounds, and Hutton’s shearwaters in the Kaikoura ranges and North Canterbury hill country. 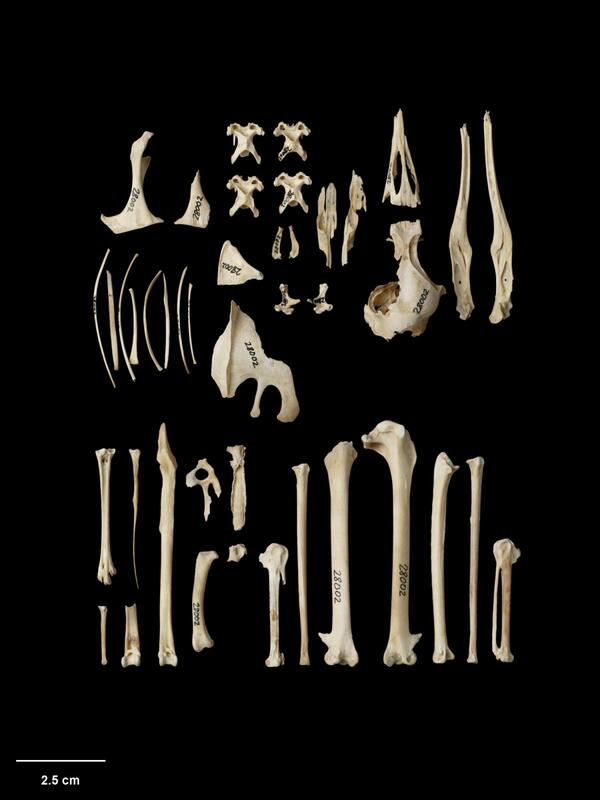 Scarlett’s shearwaters clearly bred at or near the type locality, possibly on cliff ledges lining the Fox River adjacent to the Te Ana Titi Cave, because almost 10% of bones in the deposit are from chicks. 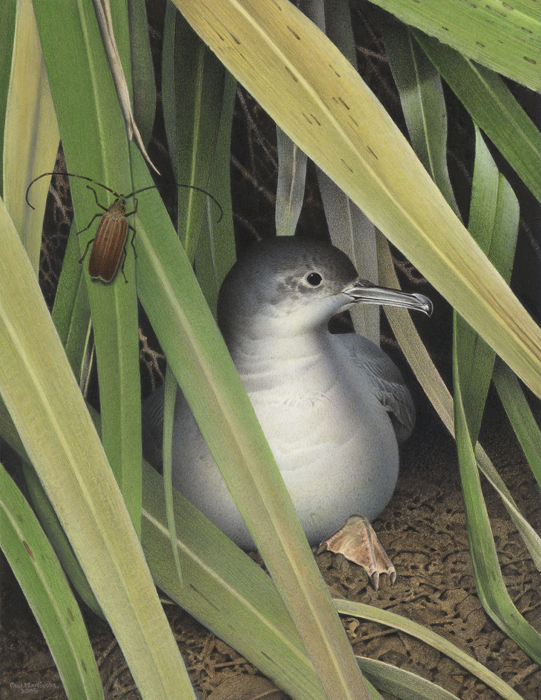 Scarlett’s shearwater probably fed on small fish and crustaceans in the adjacent Tasman Sea throughout the year. They became extinct shortly after human settlement; breeding colonies may have been over-exploited directly, and the small size of Scarlett’s shearwaters would have made eggs and chicks vulnerable to predation by the introduced Pacific rat (kiore). Before human settlement, there would have been many petrels breeding on the mainland of both islands, providing a major transfer of nutrients from the surrounding seas to the land. This ecologically important nutrient flow was interrupted as mainland colonies became extinct under the pressure of human hunting and the impacts of introduced mammalian predators. The long term effects of this cessation of nutrient flow on vegetation growth and patterning is unknown. Holdaway, R.N. ; Worthy, T.H. 1994. A new fossil species of shearwater Puffinus from the late Quaternary of the South Island, New Zealand, and notes on the biogeography and evolution of the Puffinus gavia superspecies. Emu 94: 201-215. Tennyson, A.J.D. ; Shepherd, L.D. 2017. DNA reveals the relationships of the extinct Scarlett's shearwater Puffinus spelaeus (Procellariiformes: Procellariidae). Journal of Ornithology 158: 379-384. Worthy, T.H. ; Zhao, J.X. 2006. 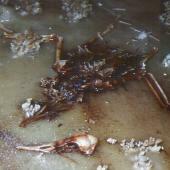 Late Pleistocene predator-accumulated avifauna from Kid’s Cave, west coast, South Island, New Zealand. Alcheringa Special Issue 1: 389-408. An extinct small shearwater of the Manx/fluttering group known from sub-fossil bones that was smaller than its presumed closest living relatives, fluttering and Hutton’s shearwaters.